We all know sleeping is essential to overall health, but did you know that poor sleep can rob you of producing certain hormones that are necessary for tissue healing? Whether you’ve never been a “good sleeper” or pain is waking you at night, your sleep quality is important to improving your pain and needs to be addressed. Our upcoming blog post will be about improving your sleep hygiene and the quality of your sleep, but this week we will be highlighting the environment and positioning involved with sleeping to minimize pain at night. 1) The right mattress is important! The Postural Restoration Institute (PRI) recommends a regular, coiled spring mattress. As the mattress is made up of many springs that individually adjust to different areas of the body, it is a great tool for our patients to sense and feel how their body is lying on the mattress and make appropriate adjustments. Conversely, a foam or sleep number mattress is either made of one large piece of material or much larger sections of air/foam. These designs cannot give our patient’s brains/bodies very specific information as to how they are lying, where most of their weight is, etc. Just as important as the type of mattress, be sure you have a quality mattress or make sure it is relatively new. All mattresses pad down overtime which will limit the mattress’ effectiveness in supporting our bodies, helping us realize where we are in space, or cause us to “fall into the ditch” of where the mattress is the lowest. All of these will increase pain and can cause night-time waking. -If getting a new mattress is cost-prohibitive for you, you can usually find a donated mattress that’s under 90 days old. Most mattress companies offer free 90 day trial mattresses that are rejected are donated to off-set the company’s loss of income. Call around to your local donation centers and you’ll be able to find where the mattress companies donate their almost-new products. 2) How you support your body differs depending on the position in which you sleep. - Back sleeping- This is a great position to sleep in, but definitely is the least popular. Be sure to keep a pillow under your knees. This slackens the muscles on the front of our hip and thigh which can pull our pelvis forward and arch our back when we sleep with our knees straight. Use a pillow that is relatively flat, but has enough structure that the arch in your neck is maintained. - Stomach sleeping- Unfortunately, this is a pretty bad position to sleep in. It allows your lower back to excessively arch and places your neck in a significantly rotated position. Even if you do not use a pillow, the TMJ (jaw joint) is placed under a lot of strain as the weight of your head is directly on this non-weight bearing joint. Many people will kick a leg out to the side in this position which places a lot of strain on your pelvis and sacroiliac joints. If you are having a lot of trouble breaking this habit, try sleeping with a pillow under your stomach. Make sure your belly button is directly in the center of the pillow. This will help to keep your lower back in a less-arched position. Keep your legs together and avoid kicking them to the side. Lastly, do not use a pillow. - Side sleeping - This is a great position to sleep in, but you want to support your body differently depending on what side you are sleeping on. This is based on the fact that our body is not symmetrical; Our diaphragm (muscle that we breathe with) does not work as well on the left which causes our left abdominals to weaken (first) allowing our left lower ribs to flare, our pelvis tends to twist to the right, and our left hip tends to rotate outward while our right tends to rotate inward. - Left side sleeping - Use a pillow that will allow your neck to stay parallel to the mattresses or causes your head to become elevated slightly (right ear should move closer to the right shoulder). Place a pillow under your left lower ribs. This helps to keep your ribs in a better position and let your diaphragm function better. A diaphragm that works efficiently will allows our neck/shoulder/back muscles to relax as they are no longer needed to help pull in air and can decrease apnic episodes! Place another pillow between your knees and try to push your right knee forward a bit forward compared to your left. This will keep your pelvis from twisting to the right and place your hip in a better position which can decrease lower back strain and irritation to the joint itself. - Right side sleeping - Use a pillow that keeps your neck parallel to the mattress. A small pillow can be used under your right lower ribs if you have a flare on that side or know you have abdominal weakness on both sides. The last pillow is placed between your ankles which places your left hip in a better position. Lastly, pull your left knee back a bit compared to your right in order to keep your pelvis from rotating toward the right. 3) Doing your exercises immediately before bed can have a huge impact. Our PRI exercises are designed to inhibit overactive musculature that are holding your body in a bad position/posture and decrease pain. By performing your exercises immediately before getting into bed, you’ll be going to sleep in the most balanced, relaxed, and pain-free state you can achieve! It also helps to decrease your fight or flight nervous system and increase our REST and digest system. This can have a dramatic impact on your quality of sleep, decrease in pain, and progress in your program. Can't Feel The Burn In The Right Place? It's happened to all of us. You're working out and know you're supposed to be "feeling it" in a certain target area, but you can't. Do you ever wonder why? The explanation is actually quite simple. That particular muscle is not burning because it's not firing. Why? It's not in the right position to be properly utilized. Our body is designed to stand with a certain posture and have our joints in certain positions. The muscles attach on very specific areas of bone so that when they shorten or contract, the bone moves in a very specific pattern. For example, our gluteus maximus (largest glut muscle) originates from the top of our pelvis and part of our sacrum at the back of the pelvis above the tailbone. It then attaches to the gluteal tuberosity on the back of the thigh bone. When this muscle contracts and shortens, your hip extends or your thigh moves backward relative to your pelvis. The only catch is that our muscles need to have a proper length tension ratio to contract fully. This means that the muscle must not be too stretched, or too shortened in order to be the strongest that it can be and fully contract all its fibers. Therefore, if the muscle is not in the correct position, and does not have the correct length tension ratio, the body will substitute another muscle that is in better position to work. This is why people who have very arched or "deep" lower backs will feel their lower backs working as they do a glut exercise. Because of the position of their lower spine and the consequential tipped-forward position of their pelvis, their glut is stretched out. Their lower back extensors are then in a shorter position and have a much more efficient length tension ratio. Therefore, that person's body will choose to use their lower back extensors rather than their glut during their glut strengthening activities as it is more efficient from a biomechanical standpoint. The therapists at Integrate 360 Physical Therapists can help. We do an extensive evaluation looking at your standing posture and performing tests to see if your joints and muscles are properly aligned. We will then work with you on ways to restore your posture and bone/joint alignment so that you can work out and live in a biomechanically correct way. Depending on your goals, this can be done in as little as one session! Next time your doing a leg raise while lying on your side and you feel it in the outside of your thigh versus your glut, or performing lower abdominal exercises that you feel in the front of your hip joint, give us a call and let us help you. Contact us at Lesley@Integrate360PT.com, Nancy@Integrate360PT.com or 314-733-5000. Why Does Everyone's Right Shoulder Droop? What do you notice in the above picture? At first glance it just looks like three boys hanging out during a soccer game. They're all wearing different clothes and are different heights. Two of the boys are leaning on one another while the third stands independently. Despite their differences, they are all standing with the same postural pattern. Take a look at them, no matter how they are leaning, they are all standing on their right legs, crunching or shortening the right sides of their trunks, and lowering their right shoulders. Doesn't this seem weird considering two of the boys are leaning in opposite directions so they can lean on one another? How does that happen? This common pattern is due to our naturally-occurring anatomical asymmetry. It begins with the asymmetrical attachment of our diaphragm. This primary muscle of respiration attaches to the back part of our lower ribcage and onto the front of our lower (lumbar) spines. The attachment sites are bigger and more robust on the right side. As this side has more attachments, it is "stronger" and tends to pull our lower spines into right rotation. Eventually this will pull our pelvis into right rotation as well. When our pelvis' and lower spines are oriented toward the right, our right hip joint is in a better, more functional position to weight bear. Therefore, we all tend to put more weight on our right leg than our left. Additionally, this muscle is asymmetrically domed. Because of our heart, the left side of our diaphragm tends to flatten which flares our ribcage and weakens our abdominals on that side. The liver, on the right side, helps to preserve the muscle's domed shape here. 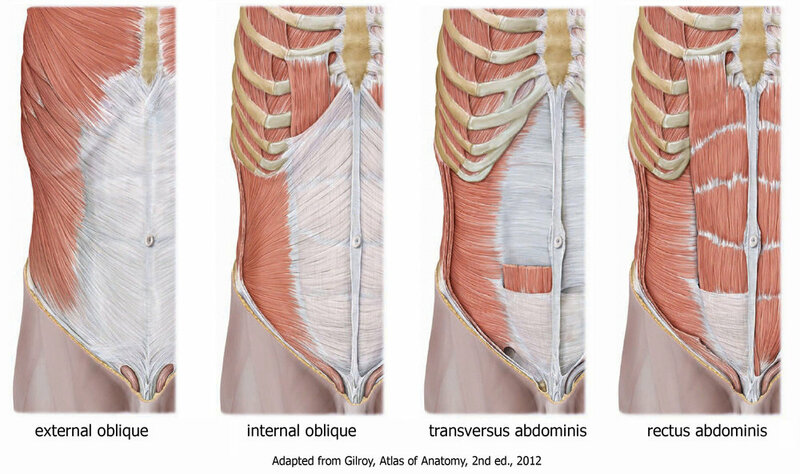 This makes the right side of our abdominals stronger than the left. Due to this and the flared ribs on our left side, our trunks tend to lean to the right. This gives us the classic lowered right shoulder. Complicating matters, when our trunks lean slightly toward the right, more weight is displaced onto the right leg. This further ingrains our postural asymmetry. In PRI language, this is called a Left AIC (anterior interior chain) position and it is the most common postural pattern. As our bodies spend more time in this position and our compensatory strategies we use due to this pattern break down, we tend to go further into compensatory patterns and this Left AIC pattern can degrade into others. To read more about this, check out our blog post What's Your Postural Pattern. This poor postural pattern, and therefore problematic loading on our muscles and joints, can lead to pain and dysfunction. A PRI trained therapist evaluates the entire body and it's systems to look for musculoskeletal position and function. We can then intervene on not only the area of pain, but also all of the surrounding areas that are feeding into the problem. Because of this more holistic approach, we are able to bring relief to many patients that have "failed" with physical therapy before, no matter where the site of pain is. Next time you're at the mall, restaurant, or airport, watch people as they stand. Typically, no matter where they are looking, what direction they're learning toward, or what side they may be holding a heavy bag or purse, they'll likely be standing on their right leg with their right shoulder low. Many of us have had some experience with orthotics. Most of us have purchased a cheap, off the shelf variety that we purchased on a whim or were suggested to us by a shoe salesman. Others of us have purchased the expensive, over the counter, "customizable" variety that you heat up in the oven and step onto as they cool, making a mold around your foot. No matter what route you took to get there, I'm guessing that your symptoms either worsened, lessened temporarily, or moved to another place in your body. Why? All of those orthotics are simply putting a band-aid on the problem and may not be any better for your body than if you were walking around barefoot all day. Any time you chose a shoe and what may be going inside of it, your anatomy, your compensatory patterns, and your pain need to be taken into account. Otherwise you're either putting your foot in a different, but still not properly aligned position. This will either increase pain immediately or after some time as your body adjusts its compensatory pattern and develops breakdown. No matter where your pain is, the position and function of your entire body needs to be assessed to see where the breakdown in your movement is. The site of pain is not always the site of the dysfunction. For example, someone may be experiencing neck pain and headaches because they keep all of their weight on their toes and lock their knees. This moves their center of gravity forward causing their hips to move forward while their shoulders lean back to rebalance themselves. The head will then move forward so that they can see the world in front of them. This places excessive stress on the neck muscles and will lead to pain. One major theme to proper position and mechanics of the entire body is the ability to sense and feel where we are in space. Our body must be able to feel where the weight is in our foot in order to tell us where our body is on the ground. Proper positioning of the ankle joint is also essential so that our proprioceptors can tell us, again, where we are on the ground and how we are moving on it as we walk. If we cannot accurately sense and feel where our body and feet are, we develop compensatory movement strategies which eventually lead to pain. Cheap, over the counter orthotics are a "shot in the dark." The chance that the amount of arch support that is built into the orthotic is actually the amount we need is unlikely. The "customizable" over the counter orthotics that are heated in the oven simply support your foot in it's improper position. This is also how corkbedded shoes work. They are typically very comfortable, but as they support you in your dysfunction, your compensatory pattern will only worsen and you will eventually experience you pain again. Rigid orthotics do not work because they do not allow your foot to change from a "loose bag of bones" that is needed when your heel first strikes the ground (this is needed for your leg to appropriately absorb the force the ground exerts on you leg at initial impact) to a rigid lever that is needed when you're pushing off of your toe of your back foot. It also doesn't allow your foot to feel and sense and change in pressure as your weight moves in your foot. What your body needs is to sense and feel the floor. The first line of attack to achieving this goal is to be sure that you are wearing the approparite shoes for your feet. Some people need more guidance for their foot while others need the motion of their foot to be controlled as they walk. If appropriate footwear will not solve the entire problem (likely to due a structural change in the foot or ankle from surgery, fractures, arthritis, etc), orthotics may be appropriate. The orthotics made at Integrate 360 are made of a dense foam and are customized to each of your feet. We take measurements of the foot and ankle, pictures of the alignment of the foot in relation to the lower leg, and impressions of your feet. The orthotics are made by Dr. Paul Coffin with respect to your PRI rehabilitation goals. Once you receive your orthotics, they will have been made to support your foot/ankle where they need some assistance and, more importantly, allow you to sense and feel certain areas of your foot as you walk. This is essential as your brain needs to sense where you are on the ground to activate your muscles appropariately. This allows your underactive muscles to turn on, while keeping overactive muscles off. From here, your therapist now has a "blank slate" to help teach your body to use these cues appropriately, strengthen "weak" muscles, and help your body to learn to move in a balanced way again. Just by changing either your footwear or orthotic, your body is now able to regain proper joint/muscle position and restore reciprocal movement allowing for perfected mechanics versus putting a band-aid on their symptom.